I’d been musing for some time which fabric would be worthy of my first Dottie Angel and when I spied ‘Cardinal in Branches’ in the Aberkhan kilo bins, the die was cast. I had fully intended to embrace the boho chic stylings so artfully portrayed on the pattern envelope. However, upon imagining Dottie covered in cardinals, I decided against breaking up the design – opting for the clean lines of View A and controversially abandoning those glorious signature pockets. As with Japanese smocks, I based the pattern size around the key measurement at the bust – 34 inches equating to a pattern size small. With a waist measurement of 30 inches, I shifted up to a medium and my hips … well let’s not even go there. I created a new pattern, using the small bodice and grading up to a medium from the waist downwards. However, I neglected to observe the contour of the side seams and my resulting toile, with it’s bagging hips, highlighted my Frankensteinian efforts. This was soon remedied by shaving a little more off the waist and hips to achieve a smooth line from the waist falling between a pattern size small and medium. The bodice fits beautifully and I adore the use of tucks as an alternative to bust shaping darts. In fact, this dress is packed full of subtle detailing and a perfect opportunity to showcase your burgeoning sewing skills – if like me, you’re a new kid on the sewing block. I cut my teeth on the French side seams, bias bound finishing and tie back belt. Forgetting to stay stitch the neckline could have been my undoing but in the final analysis I think Dottie emerged unscathed. Tis the season to be (insert as appropriate) and on taking a stroll down your local high street, you’d be forgiven for thinking Christmas was imminent. My Dottie Angel rendering is suitably seasonal in the fabric design and method of construction -its bias bound seams and finishings reminiscent of a ribbon encased present. As far as membership of our office ‘Team Christmas’, I couldn’t be further from making the grade – I seriously lack the necessary credentials, having opted out of present buying years ago. Thankfully, my family have embraced the concept of ‘presents for the table’ wholeheartedly and we sit down to every meal greeted by a table heaving with the finest jams, chutneys and dressings. Discovering the Dottie Angel pattern has given me a window into the world of its creator. Her open plan living space with creative areas for each dweller, has me caught up in an aspirational web and has impelled me to continue swimming against the tide as far as the Winter holidays are concerned. I’m happy to trade in a Meadowhall trolley dash for shared experiences with friends and patronising Sheffield’s independants – coffee at Tamper, brunch at Grind, a film at The Showrooms and hamper worthy fodder from Mr Pickles – whilst giving the season a sartorial nod, garbed in my Dottie Angel. Its gorgeous…. 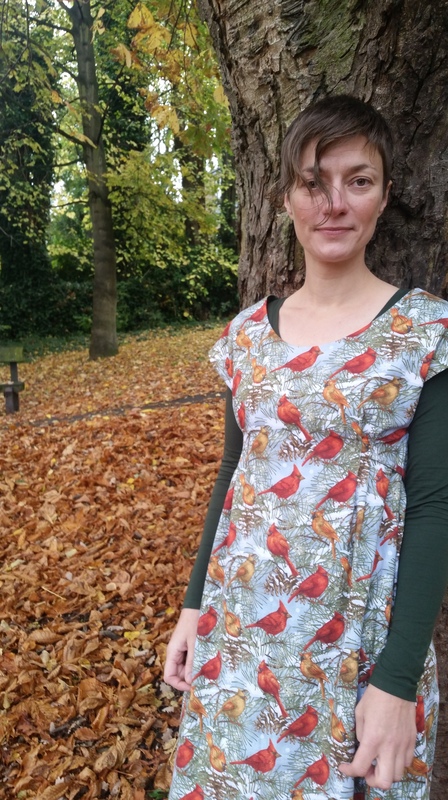 it took me a while to see the winter reference in the fabric (I thought the bird colours autumn, especially with those leaves in the photo – didnt see the snow -and admired your boots again!) the above waist shaping is very effective. surprised you didnt include pockets! (I have never bothered to stay stitch necklines, I dont know if this is a good or bad thing, but I figure if you are not too rough with it, it will be fine, – high chance I am incorrect but it has yet to come back and bite me, unlike some other theories)…. Yes, I think you were right to leave out the pockets on this one. It’s so pretty and the colours suit you. I think Christmas jumpers leave a lot to be desired and am not surprised to know that you didn’t jump on that band wagon. Not just a Christmas dress then – more a dress for all seasons.